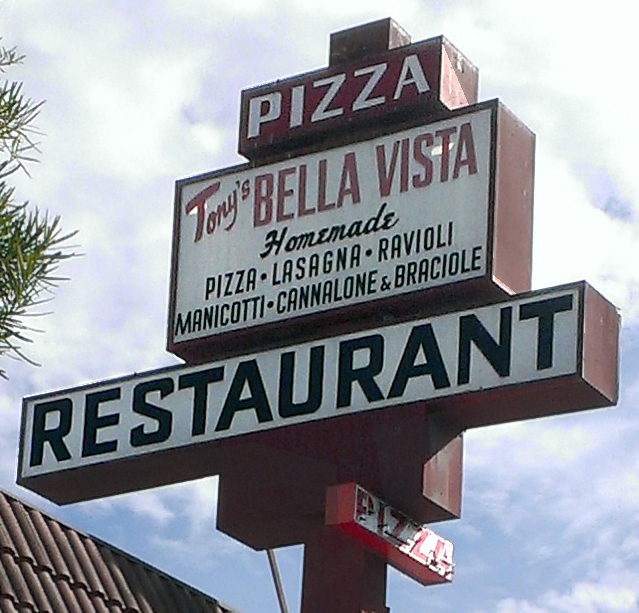 (1965) Tony Bella Vista Restaurant, Burbank | Remains of L.A.
-Incredibly cozy, dim lighting and warm smells. Just inside the door is a mural on the wall showing the Italian seaside, and a curtained booth for the cashier with lots of foreign money taped up all over the walls. Dark wood and red chairs and tables, wallpaper with a lovely pattern of vines, the place is decorated to seem like you’re outside on a veranda, sitting under porches, the rafters of which are hung with white christmas lights and grape vines heavy with bunches of grapes. David (my husband) pointed out that walking in felt a little like entering a Disneyland ride, and he was right, but in the best possible imaginable way. Something about sitting in there made me feel safe and happy and good. -I got the homemade ravioli with meat sauce, which turned out to be outrageously delicious. It came with a mixed green salad, which was about what you can expect from a mixed green salad, and the table got slices of garlic bread that David (my husband) called “dauntingly large” until we tasted them, and they turned out to be so perfect we went in on an additional half-order. -I got the hiccups just before the food came, and that always makes me feel scared because I get worried someone will try to get rid of them by scaring me, and only thing I hate more than being startled is thinking that at any moment something startling is going to happen. So the first thing I do when I get the hiccups is tell everyone nearby to please not try to scare me. I explained this to Corey (David [my husband] already knows) and he asked if maybe he should just tell me something mildly upsetting instead. Then I drank a glass of water while holding my breath and the hiccups went away. -Opera music was playing over the sound system when we sat down. I don’t really seek opera music out, but I quite enjoy having it in the background from time to time. They switched to Frank Sinatra after a bit, though. 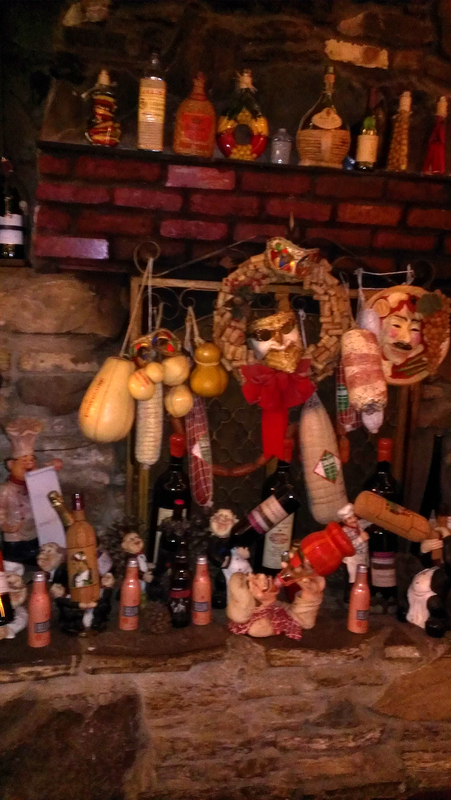 -Against one wall was a large stone fireplace, filled and covered with a collection of wine bottles, comical statues of Italian men in chef hats, loafs of bread, and really fantastic masks. 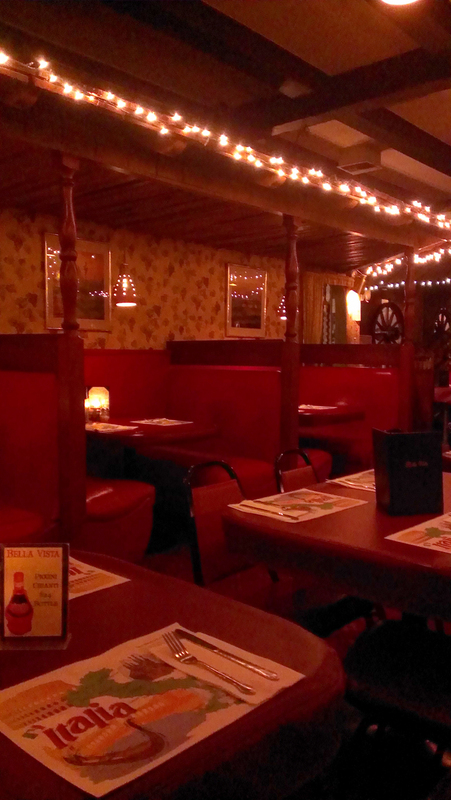 -In the corners of the booth, against the carved wooden “porch” railings, were bottles of wines in those straw baskets. They were tied to the railings with strings of straw, I suppose so people wouldn’t pick them up to look at them, which is what I was trying to do when I discovered that they were tied to the railings. -They brought those little bottles of oil and vinegar for my salad. The vinegar bottle was extremely sticky, and then my hand was sticky, but the outside of my drinking glass was wet and so between that and my napkin it was all okay. -On the walls were more really great masks, and framed pictures of what we thought was probably Italy but it was a little hard to tell because the lights were reflecting off the glass so much. -The first time I visited the ladies’ room I was surprised to find it quite messy; this didn’t seem like that sort of place. But then I went again before we left and it was pristine and I realized the messiness had been a momentary fluke. -The people in the booth across from ours sure did like each other a lot. First I noticed that the woman kept reaching over to rub her dining companion’s bald head, as if for luck, and each time the rubbing would go on for longer than you’d think. Then they moved around so that they were both sitting on the same side of the booth and there was a lot of kissing in between the eating. I wasn’t trying to watch, they were in my direct line of sight so I saw them overtime I looked up from my plate. -It seemed like maybe something had happened among the staff. A whole lot of them were gathered in the back part of the restaurant, talking in low voices. I couldn’t get any idea of what; no one was crying or anything, or seeming too upset. Just t hat sort of gathering when something big has occurred and you want to be near your coworkers and whisper about it. -As we were leaving, we saw that by the door, in addition to the ubiquitous “catch a toy with a claw” game there was a game called “Mr Baseball.” The way it works, you put a quarter in, and a ball comes down, and you aim it at one of several holes and shoot and if you get it in a hole you win a superball! I tried it and was very excited when I won, and then realized that you always win. It’s really just a fun way of buying a superball for twenty-five cents. What Sort of Ghost I’d Expect to Find if I Believed in Ghosts Which I do Not: A couple who came here on their first date, and returned every year on their anniversary.